We offer human anatomical charts on board, with led. switch are provided to highlight the particular area, so that studnets can see the particular part from some distance also. We are the manufacturers of the Charts of the study of Vertebrate. 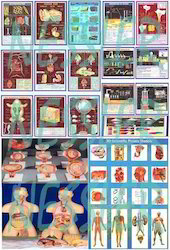 We are offering a wide assortment of finest quality Polyart Plastic Human Reproduction Charts to our clients. Anatomically Perfect. Water proof, markable and washable charts. Our organization is engaged in publishing various types of Health And Hygiene Charts. The range of these charts is developed using fine quality paper and colored ink and hence, has high tear strength. These charts are used for demonstrating the importance of health and hygiene to the students. We manufacture a wide range of charts that are made on water-proof rexine. Offered in 30" × 40" (75 × 100 cms) approximately dimensions, our products are durable in quality and are do-not wear-out, wrinkle or get spoiled easily. The colors used in these charts are water-proof in nature. circular / strip / fanfold / rectangular / thermal / etc. on special most suitable paper for slow recording without spreading of Ink & fast drying on paper. A set of 6 models, showing the process of mitotic cell division. The chromosomes are painted for easy identification. 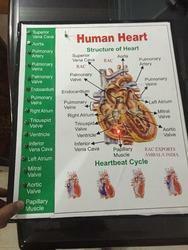 Glass agencies are manufacturer of respiratory system chart.